Some people use custom engraved knives for everyday tasks, some like wood carving personalized knives, and others for fishing and hunting and so on; keeping a track of the tasks which utilize engraved knives won’t do justice with their vastness. Many people like to gift their friends fine engraved pocket knives, some individuals even have a collection of them too. However, knife import offers a huge variety of engraved knives to choose from that will beat the others! For knife engraving below are few best knives hand picked that you would surely consider to choose as engraved knives. Need a functional folding knife, eh? You will be stunned by magnificent performance. It’s a tactical pocket knife that can be folded and unfolded when needed. Made up with stainless steel, which is 3.25 inches in length. The handle is made with aluminum (which is lightweight enough to carry) and wood overlay. It also has a belt clip so that you don’t have to worry about how to carry it. Small, efficient and easy to carry, what else do you ask for? All these characteristics make it a cool knife, and you can make it look more cool by getting this piece engraved. This classic spring assisted knife has everything covered. Whether a gentleman is looking a knife with finesse and elegance or an enthusiast is looking for something smart and efficient. Its 3 inch blade made with black stainless steel is sturdy enough to cut through anything. Pakkawood handle adds to its strength and classic look. It’s small enough to keep it in your pocket; in fact it’s assisted with a pocket clip too. Your safety is taken care off if you are equipped with spring assisted knife with brown Pakkawood handle. The Pakkawood handle makes it one perfect knife for being engraved. Looking for something to handle “the tough job”? Well, if yes then look no more than Tomahawk Axe Hatchet. Not too big to handle and not too small to leave you second guessing about your weapon. Overall length of the axe is inches. It has 4.75’’x2.5’’ blade length. It’s efficient enough to cut through in a single strike. It’s the best weapon to pick to add in your survival backpack. This axe comes with a nylon sheath to protect the blade and user when it’s not in use. 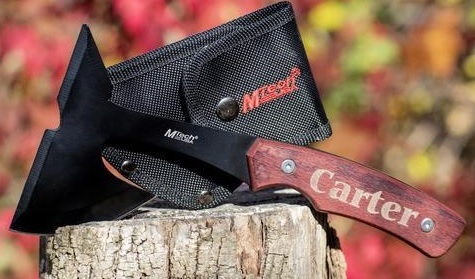 Majorly suitable for cutting firewood and other related carpenter tasks. The Pakkawood handle will look cool with your name engraved on it. For the adventure chasers who love to be out in the woods, this fixed blade engraved hunting knife is a wise choice. Not only it consists of a razor sharp blade, but also the handle is made with Pakkawood which provides the user with a firm grip; hence ensuring its safe usage. As functional as it is, it has a sleek look too! It also has a genuine leather sheath which itself is beautifully made. The sheath is for preserving the hunting knife safely when not in use. The longer the most suitable for engraved text, right? This one is like you have never seen before I am sure. Devilish knife constructed with curves and edges you have never had in your knife before. It is also a long and sturdy one. A fixed blade with stainless steel is all you need in a survival kit. This survival knife specifically provides the ergonomic functioning ability, how? Its needle like pointed tip and razor sharp blade does the job perfectly! If you want a survival knife or something powerful for hunting or fishing then look no more, this engraved knife will fulfill your need far more than “just” satisfaction. Are you tempted to see such an incredible collection of engraved knives? Well, Knife Import has the best of them!